SmartLoad is a GMS Module that typically reduces unit train load out by an hour. The system eliminates the dead time between completing one car and getting the next car into position. 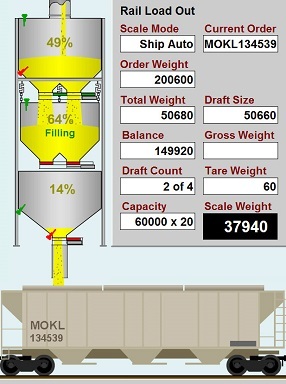 The regular SmartLoad automatically starts the order for the next car and holds the first draft in the weigh hopper. This equates to a saving of around 20 seconds a car. or about 36 minutes on a unit train. Super SmartLoad takes this a step further and also holds a weighment in the lower garner. This saves around 50 seconds a car, or about an hour and a half, on a unit train. To run Super SmartLoad requires a lower garner gate and an empty level sensor in the lower garner. If the gate is fitted with cylinders and a close limit switch, GMS can completely control the operation of this gate. Below is a demonstration of the difference between using SmartLoad and not using it. The top row shows a conventional load out situation which is not using SmartLoad. The left hand picture represents the end of a car order, where the scale has stopped and the last amount of grain for the car under the spout is draining out of the lower garner. The middle picture shows the upper garner continuing to fill while the operator moves the next car into position. The right hand pictures shows that the upper garner is starting to overfill because the next car is still not in position. Hopefully this situation does not happen too much because at best it requires that the feed to the leg be turned off or at worse the leg starts to back leg and the operators will be spending quality time in the pit digging out the grain. The bottom row shows the system running Super SmartLoad. The left hand picture is exactly the same as the picture above. We are just finishing off the last car. You will notice that we have a much smaller upper garner because as you will see later, we don’t need it. Reduces the initial capital cost. The middle picture you can see that we have started the next car. We are able to do this because our SmartRead RF system has read the next car and automatically started up the bulkweighers to process this order. You will notice that we have relieved the upper garner of a full draft allowing us to run the leg longer. We have also performed 2/3rds of a draft saving us approximately 20 seconds. The right hand pictures shows that because we have a lower garner gate, we have automatically closed that gate when the grain from the last order emptied out of it and have filled it with the draft that was in the Weigh Hopper and are now holding another draft in the weigh hopper. We have saved almost 50 seconds because as soon as the car is in position we can immediately dump two weighments into it. Note that in a real life comparison, the saving is more likely to be around an hour because most operators who are not running SmartLoad will manually try to emulate some of the routine. However given the high pressure of loading cars and the 10 – 15 hour duration, it is very difficult for an operator to come close to this automated system.